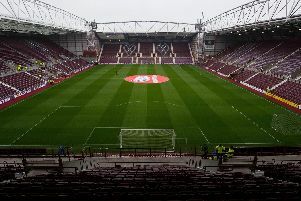 The Red Lichties were cruising to a win and with news filtering through to Gayfield that their two nearest challengers, Raith Rovers and Forfar Athletic, looked to be heading towards defeats by basement clubs Stenhousemuir and Stranraer respectively, the prospect of the title being clinched via a triumph over their historic rivals looked certain. But the euphoria was dampened by news of Liam Buchanan’s stoppage-time equaliser for Raith. Arbroath had taken the lead through Ricky Little in 64 minutes but had failed to put the game to bed when Ryan Wallace saw his penalty saved by Allan Fleming. 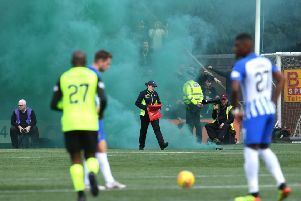 The result leaves them 12 points clear of the Kirkcaldy side with four games remaining and the uncorking of the champagne looks to be a mere formality. Raith have been chasing Arbroath since the start of the season but a series of disappointing results has seen them fall further behind and they looked set for further misery at Ochilview when Mark McGuigan fired Stenhousemuir into the lead just before the hour. Disaster was averted, however, when a late leveller by Buchanan, pictured, secured a 1-1 draw and a valuable point. The Fifers are now two points clear of third-placed Forfar, who remain in play-off contention despite losing 2-1 at struggling Stranraer. The Wigtownshire side took a first-minute lead at Stair Park through Joao Pereira Vitoria and although Gary Irvine pegged one back for the Loons before half-time, a 71st-minute strike by Connor McManus gave Stranraer victory. Dumbarton eased their relegation fears with a 2-1 home win over Brechin, Dougie Hill opening the scoring for the visitors before an own goal by Lewis Toshney and a Calum Gallagher header secured victory for the Sons. Airdrie and East Fife slugged out a goalless draw at the Excelsior.